Investigating a plane crash in the Smoky Mountains in North Carolina, forensic anthropologist Temperance Brennan discovers in a most disturbing way that the evidence doesn't add up. Tripping over a coyote-chewed leg at the crash scene, she performs a little mental arithmetic and realizes that this victim wasn't on the plane. Once again, Brennan's high-tech DMORT snaps into action faster than you can say "Disaster Mortuary Operational Response Team." Long before the Bones television series became a long-running hit show, Kathy Reichs had been writing about her fascinating forensic anthropologist Temperance Brennan. I really enjoyed this fourth novel in a series that later this year has its twentieth instalment (one of the books being a short story collection). For those who aren't as familiar with both the book world that Reichs created and the TV world inspired by her books, it's worth noting the two worlds are very different in many ways (for me, I prefer the book series while still enjoying the TV show, and the book 'Tempe' character is more interesting - but I can understand how different people will have different preferences, eg especially if they're big fans of the actors, or characters that are in the show that aren't in the books). FATAL VOYAGE begins with a mess of bodies in the wilderness, the wreckage of a plane crash where forensic anthropologist Temperance Brennan is on scene, using her skills to help with the horrifying task of trying to help identify some of the victims. It's a nightmare scene for all involved. Reichs writing flows well, she draws us in to the situation and the life of her characters, which then become more complicated when remains are found that aren't from the plane crash. Brennan's own life is in danger, and she has to juggle the heartbreaking job of identifying the plane crash victims while dealing with various other personal and professional challenges. 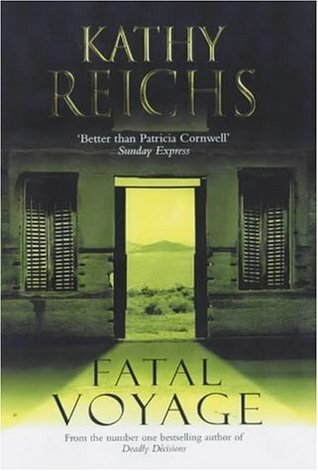 There's a lot going on in FATAL VOYAGE, multiple threads which might bother some crime readers who prefer things more straightforward or simple, but I enjoyed this aspect and felt Reichs wove things together well. Brennan's job as a forensic anthropologist splitting her time between duties in North Carolina and Quebec (mirroring Reichs' own resume) offers opportunities to take readers into all sorts of situations and 'worlds' over the course of the series. In FATAL VOYAGE brings the reality of plane crashes and all the things that are involved with dealing with them to stark life. She doesn't pull any punches, giving readers insights beyond what's gleaned from headlines and news stories. It's macabre at times, but handled well and you feel you're learning some fascinating things while intrigued by the mystery. As I mentioned above, the Temperance Brennan of the books is much different to the one portrayed by Emily Deschanel in the TV series. The characters share a name and occupation, but that's about it. Book Tempe is older, a divorced recovering alcoholic who has an adult daughter, is far less socially awkward, and lives and works in North Carolina. Family is important to her - her sister, niece, daughter, and ex-husband all feature regularly throughout the series. She has an on-off relationship with Detective Andrew Ryan, and has a tendency to act like a teenager sometimes, even if she's a middle-aged woman who's at the very top of her profession, nationally and beyond. She's incredibly smart in some ways, but a little naive or prideful at other times, causing herself some grief. In other words, she's a very human and quite relatable character. If you enjoy forensic thrillers, then I think you'd like FATAL VOYAGE. Reichs is a good writer who took the baton from Patricia Cornwell's groundbreaking Dr Kay Scarpetta series, and ran with it. Temperance Brennan (books world) is a fascinating, at times frustrating, character whose viewpoint we follow in first-person, taking us behind-the-scenes into intriguing, sometimes horrifying, worlds - all done with some sense of humour and humanity that helps keep the morbidity at bay.